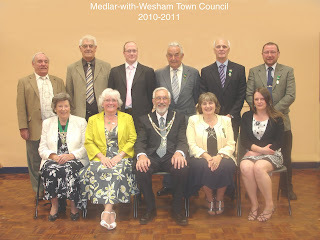 The new Mayor for Medlar-with-Wesham was installed at the meeting held on 18th May. The outgoing Mayor, Cllr Linda Nulty handed over the chain of office to the new Mayor Cllr Alan Clayton. In proposing Cllr Clayton , Cllr Nulty added that she was certain that she was handing over to a 'safe pair of hands' and reflected on the work he has done for the Town Council and the Community Pride Trust for very many years. The proposition was seconded by Cllr Ann Whitby. Cllr Clayton paid tribute to the retiring Mayor and Consort, Mr Richard Nulty, adding that he felt that they had been excellent ambassadors for the Town during their year of office. Cllr Clayton also congratulated Cllr Nulty on her appointment as Deputy Mayor of Fylde. Cllr Nulty was presented with a 'Past Mayors Bar ' to be attached to her Badge. The New Mayor then proposed Cllr Ann Whitby to be Deputy Mayor which was seconded by Cllr Geoff Dixon. Fylde Borough Council's Planning Committee refusal for the 264 houses on the land to the North of Mowbreck Lane has been challenged by the land owner who has appealed against the decision. The date for the appeal has yet to be announced. 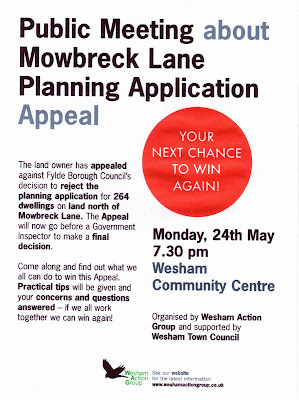 Wesham Action Group are hosting a public meeting at Wesham Community Centre on MONDAY 24th May at 7.30pm, to give advice on how the appeal can be rejected. Members of Wesham Town Council will also be on hand to answer any questions.